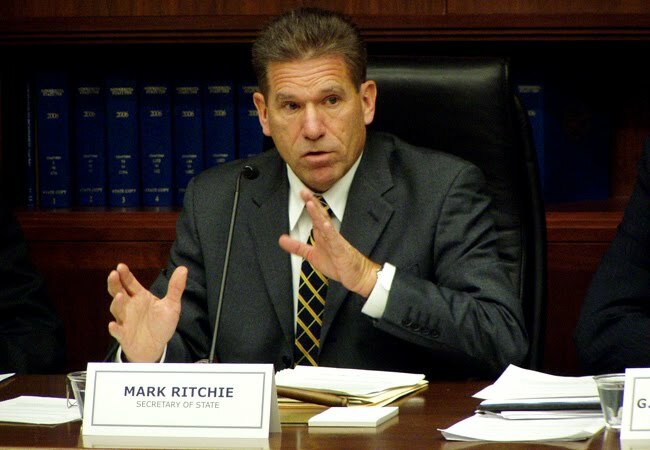 Minnesota's Secretary of State Mark Ritchie, has been supported by some very radical people. A quick view through Ritchie's 2006 supporters list highlights five main interrelated socialist organizations and one highly influential family. Communist Party USA Four prominent members of the Minnesota/Dakotas Communist Party appear on the list - not surprising given given Ritchie's high level ties to this organization. Democratic Socialists of America The US's largest Marxist organization is represented by several known members and supporters . Institute for Policy Studies One of the most influential far left organizations in America. Brian Crozier, director of the London-based Institute for the Study of Conflict , once described I.P.S. as the "perfect intellectual front for Soviet activities which would be resisted if they were to originate openly from the KGB." New Party A radical party formed by Democratic Socialists of America and the Institute for Policy Studies in the early 1990s. Its most successful candidate has been Barack Obama. Mark Ritchie was an early New Party "builder". Students for a Democratic Society The leading leftist student radical organization of the 1960s. many of its leaders went on to work through the Institute for Policy Studies and Democratic Socialists of America. The S.D.S. also spawned a terrorist offshoot, the Weather Underground. Sarah Siskind The wife of Joel Rogers. A New Party founder and lawyer. Works for the Wisconsin office of Barack Obama's old law firm Miner, Barnhill & Galland. Socialists and communists seldom support politicians who are not sympathetic to their cause. Why would Mark Ritchie be supported by some of the most militant socialists in America, if they did not consider him one of them? Brought to you by the clown who stole a seat for Al Franken-stein. I no longer drink but the day Soros dies I may.I know hell is all warmed up for him and his cronies.I don't get Gays or Commies but Gay is between them and God,not for me to judge, but Communism IS between Them and Us and it is Satanic to the core,religion for the godless if you will.Once an apple starts to rot I've yet to see it stop. Anonymous, you are so insightful! I agree with you 100% and I hope the worst chamber in hell has Soros' name on it! There is hope and it will come today............please Lord, help America and its citizens, even the ones who were led astray with their left wing ideology. FYI: I created the Seattle Liberation Front as an explicit opponent to the Weathermen and the Weath Underground. When J. Edgar Hoover and John Mitchell brought an indictment against me and 3 other SLF members, they also simultaneously indicted 4 Weathermen as part of an alleged conspiracy in the trial that became known as The Seattle Seven--a brilliant attempt to link me and the SLF to the Weathermen, brilliant because we stood trial together even though we couldn't stand each other precisely because I had formed SLF to oppose the Weathermen. So what exactly do you get out of falsely associating me with them? Also, I was never a member of the Democratic Socialists of America. I founded an organization called the New American Movement in the early 1970s, then left it and 9 years later it merged with the DSA. I spoke at the conference at which those two merged, but never was a member of DSA. Seeing this distortion in the account, I caution other readers of this blog to recognize that the information here is completely unreliable!